The fact there is Christmas in Bangkok speaks volumes about the Thai culture. How, in a country where 92% of people are Buddhist, is Bangkok awash in Christmas Trees, Merry Christmas banners and even Christmas carolers? Simple, if it makes one smile, “isn’t it beautiful” outweighs any religious significance. While I have not encountered any Monks caroling or sitting beneath one of the giant Christmas trees that are at every major intersection and shopping mall, thousands of other Bangkokians are. Beer gardens from Tiger, Singha and Chang have been constructed around the giant tree in the primary shopping center. In the mall, Santas ride golf carts, marching bands play carols and everyone is happy and snapping pictures. “Merry Christmas” is the greeting from all Thai people to any Westerner. Yes, all Christmas trees are “fake”, evergreens do not prosper in this kind of heat, 3 days until Jesus’ birthday and it will be 87 today. The snowflakes painted on shop windows border on comical. I shared that “I cannot believe it either look” with an Englishman in the Siam Paragon mall. There was no reason for us to speak, the look that transpired was enough: two white guys a head taller than everyone else in the middle of Bangkok caught in a marching band playing Frosty the Snowman with 200 Thai’s snapping photographs and smiling with unreserved joy. The genuine enthusiasm challenges my cynicism. There is no worry of insulting someone with “Christmas” instead of “Holidays”, the trees and decorations are not blatant consumerism or pushing agendas. 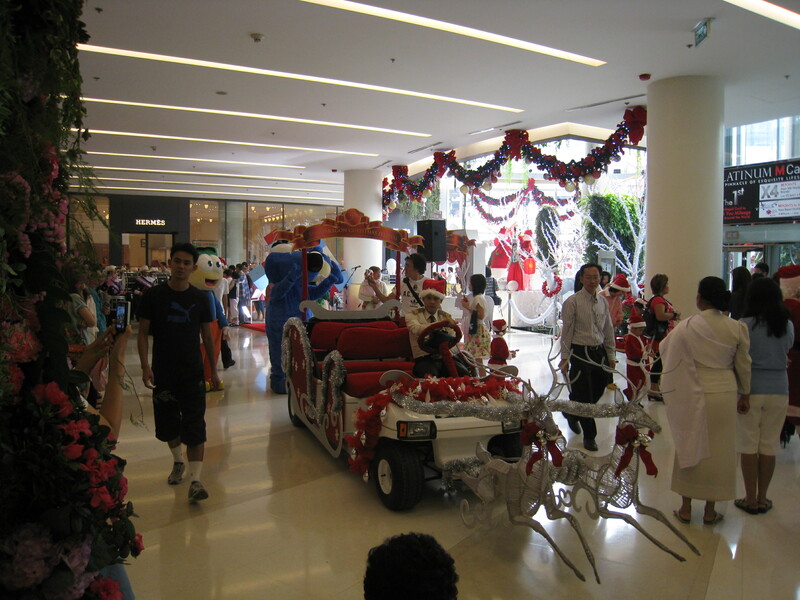 It is fun, Thai people have seen Santa on TV programs and want to take part. One simple question as I returned to my apartment summed up Christmas in Bangkok, I was asked by a Thai friend “are you going to put a sock out and hope you get something in it tonight”? 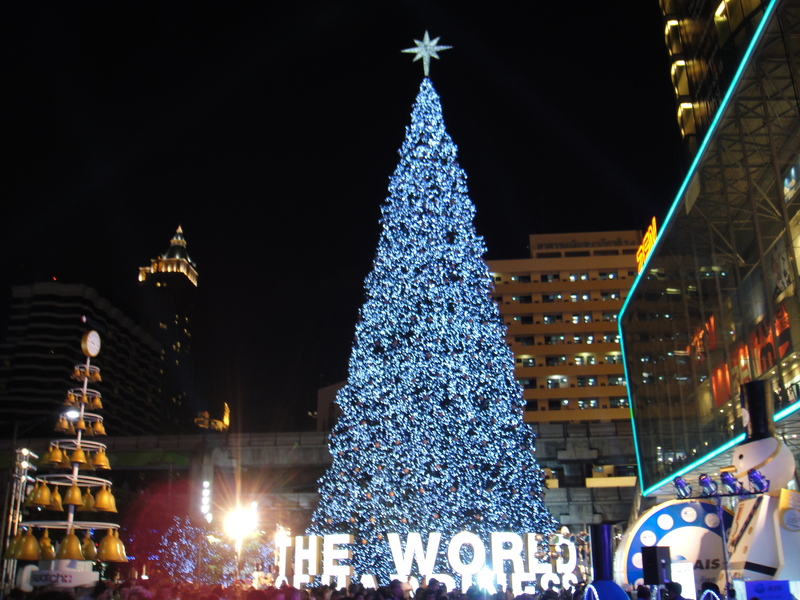 This entry was posted in Bangkok, Thailand and tagged Bangkok, Bangkok Christmas, Christmas tree, Thailand. Bookmark the permalink.